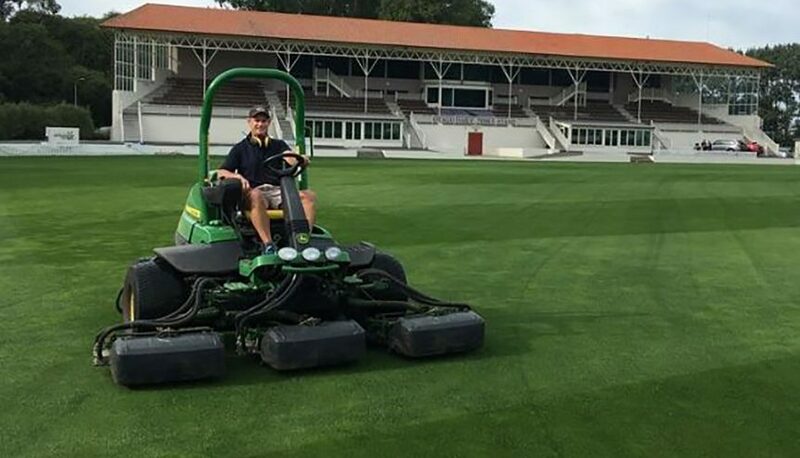 Marcel McKenzie’s 1st class cricket career might be a distant memory but the 40 year old is back in the middle returning to his grass roots as a key addition to the grounds crew at the University of Otago Oval in Dunedin. McKenzie grew up on a North Otago farm near Oamaru and says the seed was planted early in life dabbling with both bat and club. Be it a golf course or a cricket oval – he was destined for a turf gig once he hung up the pads. “As a young kid on the family farm I made a cricket wicket and a 9 hole golf course, I guess the writing was on the wall from a young age. I really enjoyed both cricket and golf so being able to work in these environments is great”, says McKenzie”. After debuting for Canterbury in 1998, McKenzie had a brief stint for one of Somerset’s minor county sides where he doubled as both player and also carried out groundsman duties. He arrived in Dunedin in 2002 to play for his home province while completing a carpentry apprenticeship, putting the turf management career on the back burner for the time being. The right-handed middle order batsmen, carved out a 1st class domestic career spanning almost 10 years for Otago and Canterbury but that was arguably trumped by a special appearance for the Black Caps in 2002 as reserve fielder which included removing Andrew Flintoff. It was a day that was far from one of greatest for the Black Caps who were torn apart by Graham Thorpe and a young Freddy Flintoff who put on 281 runs for the 6th wicket partnership but a memorable one for McKenzie. “I was lucky enough to be selected as 13th man for New Zealand when they played in the Canterbury or Otago area”. “On that occasion I got to field the whole day as Chris Cairns was injured. After a record partnership, Andrew Flintoff decided to hit out and I happened to be in the right position”. In 2015 an opportunity came up at St Clair Golf Cub as assistant greenkeeper and the turf management bug was reinvigorated, completing his apprenticeship in 2017. McKenzie says the transition between golf and cricket has been a smooth one. Dunedin cricket fans will have to be patient to see the Black Caps when they face off against Bangladesh in an ODI on February 20th with both the Sri Lankans and Indian’s only visit to the south being Hagley and Saxton Ovals for the international season to date. McKenzie also hinted that all going well batsmen can expect more pace and bounce than past wicket and said ground staff were looking to remove the stigma around how the pitch has played in the past. He said the preparations have been going to plan to date.